Congratulations to the award winners as well as all-stars for the 2012 season. Upcoming events will include voluntary workouts and announcements regarding the start of the 2013 season and Golf Tournament. WORCESTER- The Worcester Mass Fury scored on a 53 yard punt return with 3:35 remaining in the game to defeat the Clinton Irish Blizzard 24-20 and advance to the EFL semifinals. Clinton had battled back from a 17-7 first half deficit to take a 20-17 fourth quarter lead before the key play from the Fury special teams late in the game proved to be the difference. Worcester improves to 9-2 and advances to face the Taunton Gladiators. Clinton ends its season with a 6-5 mark. Trailing 7-0 in the second period, Clinton quarterback John Riccio completed a 74 yard touchdown pass to Brandon Holt to tie the score. The Fury would run off ten consecutive points before Chris Nieves returned a kickoff 81 yards for touchdown sending the Irish Blizzard into halftime only trailing 17-14. Defense and special teams would rule the second half. A fumble recovery by Clinton’s Mike Dale and some tough running by Scott Allard and Joe Rice set up a 37 yard field goal by Adam Maher. Maher drilled the kick through the uprights to tie the game early in the third period. Early in the fourth quarter, linebacker Justin Bailey’s second interception of the game gave Clinton possession on its own 42 yard line. A 25 yard run by Joe Rice and a facemask penalty put Clinton inside the 20 yard line. The Irish Blizzard would eventually settle for a 36 yard field goal by Maher and take their first lead of the game with 13:50 remaining. That lead would stand until there was less than four minutes left to play, when the Fury would score their only points of the second half on the big 53 yard punt return. The Irish Blizzard did manage one final threat. Three consecutive completions by Riccio gave Clinton a first and ten at the Worcester 32 yard line but Clinton could not move any further as the drive stalled and the Fury held on for the 24-20 win. The Irish Blizzard got a spectacular effort from its defense, particularly in the second half. After yielding 17 first half points, the Clinton defense held the Fury offense scoreless in the second half. Justin Bailey pulled down two interceptions. Fellow linebacker Mike Dale’s deflected pass led to one of Bailey’s interceptions. Dale also recovered a fumble. Linebacker Brian Learned forced one fumble and safety Chris Leblanc added a recovery. Cornerback Eric Arsenault picked off a Fury pass, as did cornerback Nieves who also had the kickoff return for touchdown. In all, the Clinton defense forced six turnovers on the night. The Worcester defense was equally as tough. The stingy Fury defense did their best to limit the normally potent Irish Blizzard offense. Riccio did manage to complete 8 passes for 120 yards and one score. Holt was on the receiving end of four passes for 83 yards and one score. Rice led all rushers with 59 yards on nine carries. Maher had a big night kicking for Clinton. He was perfect on an extra point attempt and two field goals (37, 36 yards). He also managed a touchback on a kickoff. Clinton's season ends with a 6-5 record. The loss marks the fourth game Clinton lost by a touchdown or less this season including three at the hands of the Fury. John Riccio’s semipro football career didn’t end the way he thought it would. So he started over again. In the process, he has rewritten the Clinton Irish Blizzard record books, becoming the first quarterback in franchise history to throw for 10,000 yards and 100 touchdowns in a career. That bitter taste has been transformed into sweetness, as the Irish Blizzard is back in the EFL playoffs, with a first-round matchup against the Worcester Fury on Sunday at 6:30 pm at Worcester State College. In his comeback, Riccio threw for more than 1,500 yards and 20 touchdowns (versus nine interceptions), topping the 100-touchdown milestone against Worcester in July and 10,000 yards at Middleboro in August. The 2010 season was supposed to be it for Riccio. His wife was expecting their first child, and the Irish Blizzard was coming off its first EFL championship in 2009. When the team found itself in its third consecutive league title game, up 21-6 over the Taunton Gladiators halfway through the third quarter, it seemed as if a fairytale ending was in the works. The fairytale turned into a nightmare. Taunton scored 20 fourth-quarter points to shock the Irish Blizzard and take the championship, 32-21. Riccio and a handful of other veteran Clinton players limped off into retirement, and the rebuilding 2011 team finished 4-5. Having a chance to erase that memory, and chase another title, proved enough to get Riccio and the rest of that core back in their pads. A product of Southington, Conn., and St. Paul’s High School, Riccio played his college ball at Worcester Polytechnic Institute. As a freshman at WPI, he found himself in camp with 11 other quarterbacks. As it turns out, Riccio’s success in Worcester was historic. His junior and senior seasons rank among the school’s best ever, with numerous career and season records, including the program’s all-time season highs for total offense, passing attempts, completions, and yards (1998). After relocating to greater Boston, Riccio joined former WPI teammates Jamie Cairns, Brian Learned, Jon Pires, and Matt Surette in Clinton for the 2005 EFL season. He was named Eastern Football League MVP in 2007, and followed that season up with an even better statistical year in 2008. He gives credit for any individual recognition to his teammates, to Irish Blizzard coach Ed Peete, and to team management’s efforts to keep the team’s roster solid in the often shifting semipro world. Longtime Irish Blizzard receiver Jim Learned has caught more of Riccio’s passes than anyone, including 11 balls for 109 yards and one TD in the 2009 EFL title game. He agrees that Riccio’s off-the-field efforts have played a big part in his success. That admiration carries over onto the other side of the ball. Riccio’s unsure how many more snaps he has in him, but says his years in Clinton will always rank among the best of his playing career. “Throughout high school and college, there were always more losses than wins on the teams I was involved with,” he says. “To contribute to the Irish Blizzard winning tradition, and to bring an EFL championship to the town of Clinton, has truly been rewarding. CLINTON- The Clinton Irish Blizzard closed out the 2012 regular season with a 24-0 shutout win over the Charlestown Townies. Despite committing four turnovers, the Irish Blizzard remained in control throughout the contest. With the win, the Irish Blizzard improves to 6-4 on the season. Clinton will play a quarterfinal playoff game on October 6th. Their opponent has yet to be determined. Following a Paul Lindberg interception, Clinton opened the scoring in the first quarter on a 7 yard touchdown pass from John Riccio to Ernie Adams. The Irish Blizzard would strike again before halftime as Riccio connected with Jim Learned for 37 yards and Felix Borukhov for 27 yards setting up a one yard touchdown pass to Bryan Sullivan. The score gave Clinton a 14-0 lead at halftime. Adam Maher’s 28 yard field goal in the third quarter extended Clinton’s lead to 17-0. Irish Blizzard running back Joe Rice would close out the scoring with a 5 yard touchdown run giving the Irish Blizzard a 24-0 advantage. Clinton’s stingy defense kept the Townies from scoring the rest of the way in recording their second shutout of the season. Riccio finished with 114 yards passing and a pair of touchdowns. Scott Allard netted 72 rushing yards on 9 carries to lead all rushers. Borukhov led all receivers with 45 receiving yards. The Irish Blizzard defense was strong throughout. Lindberg’s interception highlighted the secondary play. Safety Gareth Watts also contributed a pair of pass breakups. Jamie Cairns, Mike Dale, Justin Bailey, and Josh Lowe played well at linebacker. Clinton returns to the EFL playoffs following a 2011 campaign where they missed the playoffs for only the 3rd time in franchise history. Clinton’s last trip to the playoffs in 2010 resulted in a trip to the EFL Championship game. CLINTON- The Worcester Mass Fury snapped the Clinton Irish Blizzard’s three game winning streak with a 21-13 victory at Fuller Field on Saturday. The Irish Blizzard led 13-7 after one period but Worcester scored the final fourteen points to hand Clinton their first home loss of the season. With the win, Worcester improves to 7-2. The loss drops Clinton to 5-4. Trailing 7-0 in the first period, Clinton’s defense forced a fumble that was recovered by Dave Claiser. Three plays later Scott Allard scored on a 1 yard touchdown run. Following a failed extra point, the Irish Blizzard trailed 7-6. On the ensuing possession, safety Derek Guimond intercepted a Fury pass and Clinton went back to work on offense. Quarterback John Riccio completed four consecutive passes the last of which was a 20 yard touchdown pass to Chris Nieves giving Clinton a 13-7 lead. Worcester would answer with a second quarter touchdown run and the Irish Blizzard went into halftime trailing 14-13. The Fury would tack on another fourth quarter touchdown extending their lead to 21-13. Clinton would attempt to tie the game late in the fourth quarter. The Irish Blizzard embarked on a fourteen play, 51 yard drive but the drive stalled on the 18 yard line as a 4th down pass fell incomplete sealing the Fury victory. Riccio finished with 18 completions on 35 attempts for 174 yards and one touchdown. Felix Borukhov (76 yards) and Brandon Holt (56 yards) each pulled down six receptions. Allard finished with 22 rushing yards and one score. The Irish Blizzard closes out their regular season with a home game on Saturday vs. the Charlestown Townies. Kickoff is scheduled for 2pm st Fuller Field. PORTLAND- The Clinton Irish Blizzard erased a 14-0 first quarter deficit in a 21-20 comeback victory over the Maine Sabers in Portland Maine on Saturday. With the win, the Irish Blizzard improves to 5-3 on the season. The Sabers jumped out to an early 7-0 lead with a touchdown on their first possession. The ensuing kickoff proved disastrous for Clinton as a fumble on the return set up another Maine score and Irish Blizzard quickly found themselves trailing 14-0. Clinton would cut into the lead just before halftime as a John Riccio to Felix Borukhov touchdown pass narrowed the deficit to 14-7. Following a three-and-out defensive stand, the Irish Blizzard put together a 30 yard scoring drive on their first possession of the third quarter. Another Riccio pass to Borukhov capped off the scoring drive and knotted the game at 14-14. Maine regained control of the game midway through the fourth quarter. A fourth and goal touchdown run gave the Sabers another lead. The extra point attempt hit the upright and Maine could only manage six points from the score and a 20-14 lead. Brandon Holt. Maher’s extra point kick gave Clinton a 21-20 advantage and its first lead of the game. The Irish Blizzard defense came up big when it mattered most shutting down the Sabers final attempt to win the game. The Irish Blizzard (5-3) win sets up a key showdown with the Worcester Fury (6-2) on Saturday. Kickoff is scheduled for 2pm at Fuller Field. CLINTON- The Clinton Irish Blizzard scored touchdowns on their first five possessions in a 41-12 victory over the Twin City Blue Raiders on Saturday night. The Irish Blizzard, winners of four of their last five, improve to 4-3 on the season. The loss drops Twin City to 1-6 on the year. Josh Lowe’s fumble recovery on the opening kickoff set up Felix Borukhov’s 5 yard touchdown run staking Clinton to an early 7-0 lead. Twin City would answer with a touchdown run on their first possession but Clinton quarterback John Riccio found Jim Learned on a six yard touchdown pass extending the Irish Blizzard lead to 14-6 after one period. Riccio and Borukhov hooked up for a 13 yard scoring pass giving Clinton a 20-6 second quarter lead. Chris Nieves and Nate Vazquez each added one yard touchdown runs to send the Irish Blizzard into halftime with a 34-6 lead. The Vazquez run was set up by a 44 yard completion from Riccio to Bryan Sullivan. The Irish Blizzard were content to grind out yards on the ground in the second half. Scott Allard’s 2 yard third quarter touchdown run closed out the scoring in Clinton’s 41-12 win. Riccio paced the offense with a sharp performance. He finished 15 of 18 passing for 160 yards and two scores. Borukhov lead all receivers with five catches for 62 yards and one touchdown. Allard and Nieves each netted 57 yards rushing and one score. Stan St. Juste, Jay Berry, Nate Orcutt, Jon Davies and Steve Meyer played well on the offensive line. The Clinton defense turned in a fine performance, forcing four turnovers and holding Twin City to 12 points on the night. Derek Guimond, Gareth Watts, and Reggie Ulmer picked up interceptions. Lowe’s early fumble recovery set up Clinton’s first score. Chris Leblanc, Brian Publicover, Justin Bailey, and Jamie Cairns each recorded a sack. The Irish Blizzard next see action on Saturday September 8th as the travel to Portland Maine to take on the Maine Sabers. Kickoff is scheduled for 4pm. The Blizz thank Jeremy Frisch and 'Achieve Performance Training' for leading workouts and use of their facility during our bye week. CLINTON- John Riccio threw for 309 yards and five touchdowns as the Clinton Irish Blizzard downed the Granite State Knights 35-12 at Fuller Field on Saturday night. Brandon Holt was on the receiving end of four of those touchdown passes. The win improved Clinton’s record to 3-3. The loss drops Granite State to 3-3. Clinton’s passing game paced the offensive attack. Holt led all receivers with nine catches for 170 yards and four scores. Chris Nieves also had a big night catching six passes for 104 yards including a 45 yard touchdown pass from Riccio. Nieves also led all rushers with 12 carries for 75 yards. Scott Allard added 42 yards on the ground. T.R. Staake, Jeff Learned, Stan St. Juste, Jeff Learned, Jon Davies, Jay Berry, and Roger Blaikie all saw time on the offensive line and helped produce 440 yards of total offense. Defensively, linebacker Justin Bailey blocked a punt and recorded seven tackles. Mike Dale had an interception and four solo stops. Safety Gareth Watts and cornerback Eric Arsenault combined for five pass breakups. Following a bye week, the Irish Blizzard next plays on Saturday August 25th. Clinton will host the Twin City Blue Raiders at Fuller Field. Kickoff is schedule for 6pm. MIDDLEBORO- The defending champion Middleboro Cobras scored a pair of defensive touchdowns and broke open a tight game with 26 second quarter points in defeating the Clinton Irish Blizzard 48-0 on Saturday night in Middleboro. With the win, Middleboro improves to 5-0 while Clinton falls to 2-3 on the season. For Clinton, quarterback John Riccio completed 11 of 20 passes for 116 yards in the loss. Felix Borukhov led all receivers with 5 catches for 77 yards. Chris Nieves led all rushers with 8 carries for 53 yards. Defensive back Eric Arsenault paced the defense with a forced fumble, two tackles for loss and a pair of pass breakups. Defensive lineman Mike Dale added a fumble recovery and a sack. Brian Publicover had a pass deflection and three tackles. Clinton returns home on Saturday to faceoff with the Granite State Knights. Kickoff is scheduled for 6pm at Fuller Field. CHARLESTOWN- Quarterback John Riccio threw a pair of touchdown passes and the Clinton Irish Blizzard defense forced four turnovers en route to a 17-6 road win over the Charlestown Townies. Clinton battled a steady rain and a stingy Townies defense to even their record at 2-2 on the season. Scott Allard ripped off a 21 yard run on Clinton’s first possession setting up Riccio’s four yard touchdown pass to Bryan Sullivan giving the Irish Blizzard a quick 7-0 lead. The Townies answered on their ensuing possession with a touchdown pass closing the gap 7-6. Adam Maher booted a 28 yard field goal extending Clinton’s lead to 10-6 in the second quarter. The weather made it tough going for both offenses in the second half. The Irish Blizzard did find success through the air as Riccio hit Felix Borukhov on 22 yard touchdown pass staking Clinton to a 17-6 third quarter lead. Clinton’s defense and some tough running by Allard and Chris Nieves enabled the Irish Blizzard to control the fourth quarter and exit Charlestown with a 17-6 win. The Clinton defense turned in another terrific performance. After yielding the early score, the Irish Blizzard shut down the Townies over the final three and a half quarters. Clinton’s defense forced four turnovers on the night. Linebacker Justin Bailey and defensive backs Chris Leblanc and Derek Guimond each recorded interceptions. Defensive back Maurice Jarmman also picked up a fumble recovery. Bailey paced the defense with eleven tackles in addition to his interception. Riccio completed seven passes for 76 yards and a pair of scores in tough conditions. Allard led the ground attack with 68 yards. Nieves and Jimmy Nolan combined for 29 yards rushing. Borukhov led all receivers with 56 yards and a touchdown on 4 receptions. Maher was a perfect three for three on kicks with a pair of extra points and a 28 yard field goal. He also recorded a touchback on a kickoff. The Irish Blizzard hit the road again next week as Clinton travels to first place Middelboro. Kickoff is scheduled for 7:30pm at Battis Field in Middleboro. CLINTON- Quarterback John Riccio threw three touchdown passes to Felix Borukhov and ran for another score as the Clinton Irish Blizzard rolled to a 36-0 victory over the Metro West Mavericks in Saturday night’s home opener at Fuller Field. A superb defensive effort by Clinton produced a safety, a defensive touchdown, and shutout on the night. With the win, the Irish Blizzard improves to 1-2 on the season. Leading 2-0 following a forced safety by Chris Leblanc, Riccio had a hand in three second quarter touchdowns. Riccio connected with Borukhov on a pair of touchdown passes before calling his own number on a 1 yard scoring run that sent the Irish Blizzard into halftime with a 22-0 lead. The defense would make the lead stand as fourth quarter interceptions by Gareth Watts and David Claiser helped seal the shutout. Watts returned his interception 28 yards for a touchdown. Riccio and Borukhov would also hook up for one more fourth quarter touchdown to close out the scoring. Riccio led the offense with 10 completions for 104 passing yards and three touchdowns. He also added the touchdown run. Scott Allard led all rushers with 31 yards on the ground. Offensive linemen T.R. Staake, Jeff Learned, Jon Davies, Jay Berry, Steve Meyer, Nate Orcutt, and Roger Blaike all saw action while giving Riccio ample protection to throw. The defensive effort was highlighted by Watts and Claiser’s interceptions. Linebackers Justin Bailey, Alejandro Miranda, Jamie Cairns, Brian Learned, and Josh Lowe smothered the Mavericks prolific rushing attack, while only yielding one first down the entire night. Defensive linemen Brian Publicover, Brian McQuade, Mike Dale, and Stanley Demesyeux combined for three sacks and five tackles for loss. The Irish Blizzard next travel to Charlestown High School to do battle with the Charlestown Townies. Kickoff is scheduled for 5pm on Saturday. WORCESTER-For the second consecutive week, the Clinton Irish Blizzard failed to hold a fourth quarter lead as the Worcester Mass Fury edged Clinton 14-12 in a wild Eastern Football League contest on Saturday night at Worcester State. The Irish Blizzard had two plays from inside the two yard line in the final seconds of the game but failed to score as Worcester’s goal line stand preserved their comeback victory. Trailing 6-0 in the second period, Clinton finally got on the board. Quarterback John Riccio connected with Brandon Holt on a 46 yard scoring pass tying the game at 6-6. The Irish Blizzard went back to work on their next possession as Ty Gamble capped off a 74 yard scoring drive with a 3 yard touchdown run sending Clinton into the half with a 12-6 lead. The lead would remain 12-6 into the final period as a crazy fourth quarter ensued. Derek Guimond’s interception of a Fury pass on Clinton’s one yard line gave the Irish Blizzard possession deep in their own territory. Worcester dropped RB Ty Gamble for a loss and safety on second down narrowing the Irish Blizzard lead to 12-8. Following their free kick, the Fury marched 55 yards for the go ahead score and 14-12 lead. Clinton immediately responded driving to the Fury 25 yard line before a fumble halted the Irish Blizzard scoring bid. As the Fury attempted to run out the clock, Matt Guimond recovered a Worcester fumble giving Clinton a final shot at victory. Riccio connected with Jim Learned on consecutive passes to give Clinton a first down on the 11 yard line. An errant shotgun snap on the next play appeared to doom Clinton backing them up 29 yards to the 40 yard line. Riccio then uncorked a 39 yard bomb to Felix Borukhov giving the Irish Blizzard a first and goal from just outside the one yard line with 12 seconds left. Following a short delay to resolve issues with the lights at the field, Clinton attempted two run plays from the one yard line. Ty Gamble was stopped short on both rushing attempts as Worcester held on for the improbable 14-12 win. Riccio led the Clinton offense completing 18 of 29 passes for 238 yards and one touchdown. Felix Borukhov was Riccio’s favorite target catching seven passes for 110 yards. Ty Gamble led all backs with 57 rushing yards on 18 carries and one score. For the second consecutive week, Clinton got a great effort from its defense. Eric Arsenault and Derek Guimond contributed interceptions in the secondary. Matt Guimond and Gareth Watts both had big nights while both recorded key fumble recoveries. The Irish Blizzard returns home on Saturday for the 2012 home opener versus the Metrowest Mavericks. Kickoff is scheduled for 6pm at Fuller Field. The Randolph Oilers scored a go- ahead touchdown with 1:22 remaining in the game as Randolph earned a late 14-7 come-from-behind victory over the Clinton Irish Blizzard in the season opener for both teams. Clinton quarterback John Riccio connected with Brandon Holt on a second quarter touchdown pass giving the Irish Blizzard a 7-6 lead. The scored held until late in the game as the Oilers drove 85 yards on their final possession for the victory. Clinton got a solid effort out of its running game as fullback Scott Allard and tailback Ty Gamble each netted 87 yards rushing. Allard recorded 87 yards on 12 carries while Gamble rushed for 87 yards on 15 carries. Riccio completed 13 passes for 111 yards and one score. Holt led all receivers with five catches for 49 yards and one touchdown. The Irish Blizzard defense held the Randolph offense in-check most of the evening. Cornerback Paul Lindberg led the way with an interception and two pass breakups. Safety Chris Leblanc contributed an big first quarter sack and a tackle for loss. Defensive lineman Mike Dale added a pair of tackles for loss. The Clinton Irish Blizzard returns to action on Saturday July 14th against the Worcester Mass Fury. Kickoff is scheduled for 7pm at Worcester State College. Thanks to all who participated in the 8th annual golf outing on Saturday 6/23. We had a great day including some great rounds of golf and later, a 'spirited' awards ceremony and BBQ. Thank you for your support of Clinton Irish Blizzard Football. Event includes 9-holes, golf cart, catered BBQ, beverages, giveaways, prizes, contests and much more. fundraising event of the year . Members of C.I.B. will be training at Athletic Based Training (ABT) in Milford under the direction of Chris LeBlanc (January thru May). Sessions are open to anyone. NOTE: All-Star awards (along with other awards) will be presented at the team banquet in January. Congratulations to the above players on stellar seasons. CLINTON- The Clinton Irish Blizzard shook off a sluggish start and a 26 point deficit to storm back for a 34-26 win over the Worcester Mass Fury at Fuller Field on Saturday afternoon. Four first half turnovers led to 26 Fury points before the Irish Blizzard ripped off 34 unanswered points. Clinton’s amassed 233 rushing yards and five rushing touchdowns while Eric Arsenault’s three interceptions highlighted Clinton’s defensive effort. Following four turnovers and a punt on their first five possessions, a stunned Irish Blizzard squad trailed 26-0 midway through the second quarter. Quarterback John Riccio got on track late in the second period connecting on four consecutive passes before Ty Gamble broke free for a 40 yard touchdown run. The touchdown cut Worcester’s lead to 26-7. An Arsenault interception right before halftime set up a Gamble 4 yard touchdown run giving the Irish Blizzard a huge boost heading into the locker room only trailing 26-14. On their first possession of the third quarter Riccio completed consecutive 20 yard passes to Ernie Adams then Jim Learned advancing the ball to the Worcester one yard line. Riccio called his own number on a one yard plunge narrowing the Fury lead to 26-21. On their next possession the Irish Blizzard immediately threatened again. Scott Allard broke free on a 44 yard run but Maher’s 26 yard field goal attempt sailed wide left and Worcester maintained the 26-21 lead entering the fourth quarter. On their ensuing drive in the fourth quarter, Clinton needed just four running plays to take their first lead of the game. Gamble and Allard combined for 45 yards in four running plays on the go ahead scoring drive. Gamble finished off the drive with a 13 yard touchdown run and after a blocked extra point the Irish Blizzard led 27-26. Clinton failed to put the game away following a 9 play drive that stalled on the Worcester four yard line. Justin Bailey made sure the Irish Blizzard got another crack at the end zone. The linebacker intercepted a pass and returned it to the Worcester nine yard line. Gamble put the game on ice taking a first down handoff and sprinting nine yards into the end zone sealing the 34-26 victory for Clinton. Stan St. Juste, Jeff Learned, Nate Orcutt, Jon Davies and Steve Meyer anchored an offensive line that produced 323 total yards of offense. Gamble led the rushing attack with 128 yards and four touchdowns on eighteen carries. Allard added 92 rushing yards on eleven carries. Riccio shook off a slow start to complete 11 passes for 90 yards over the final three quarters including a stretch of nine completions in 11 attempts during the second and third quarters. Jim Learned led all receivers with four catches for 47 yards. Adams chipped in with 22 yards on three catches. The Clinton defense held the Fury scoreless over the final two and a half periods. Arsenault’s three interceptions and Bailey’s fourth quarter interception highlighted the defensive effort. Linebacker Jamie Cairns had nine tackles. Roger Blaikie and Luis Rodriguez combined for 11 tackles including two tackles for loss. Dave Flaherty contributed a pair of pass breakups. With the win Clinton improves to 4-5 on the season. The loss drops Worcester to 6-3 on the year. LEOMINSTER- The Twin City Blue Raiders scored a go-ahead touchdown with under two minutes remaining to edge the Clinton Irish Blizzard 14-9 on Saturday night at Doyle Field in Leominster. Clinton had assumed a 9-8 lead following Ty Gamble’s 6 yard third quarter touchdown run. Trailing 8-0 midway through the second quarter, the Irish Blizzard finally got on the scoreboard. An 18 yard completion from Josh Euglow to Jim Learned set up a 26 yard field goal by Adam Maher cutting Twin City’s second lead to 8-3. Clinton would eventually take the lead in the third quarter following a 9 play 57 yard drive. Euglow completed consecutive passes to Ernie Adams and Bryan Sullivan setting up Gamble’s 6 yard touchdown run. Following a failed conversion the Irish blizzard led 9-8. Clinton maintained its lead until the Blue Raiders final possession. Twin City put together a scoring march that culminated in a touchdown pass with less than two minutes remaining to retake a 14-9 lead. The Irish Blizzard tried to answer marching 34 yards in the final minute before a Blue Raiders interception ended Clinton’s scoring bid. Clinton fullback Jim Nolan racked up 51 yards on 7 carries to lead the Irish Blizzard rushing attack. Gamble contributed 39 yards and one touchdown. Euglow completed 9 passes for 72 yards. Learned led all receivers with 3 catches for 34 yards. Adams also added 3 catches for 26 yards. Defensively, the Irish Blizzard were led by cornerback Shawn Morin. Morin posted a fumble recovery and two interceptions. Safety Sean Marron contributed a forced fumble. Cornerback Paul Lindberg added a pair of pass breakups. The Irish Blizzard return home to face the Worcester Mass Fury for the regular season home finale. Kickoff is scheduled for 2pm on Saturday Sept 17 at Fuller Field. CLINTON-The Middleboro Cobras scored 34 unanswered points over the final two and a half quarters en route to a 48-7 win over the Clinton Irish Blizzard at Fuller Field on Saturday night. With the win Middleboro improves to 5-2 on the season while the loss drops Clinton to 3-4 on the year. Early on the Irish Blizzard showed signs of life with an impressive 14 play 75 yard scoring drive. Ty Gamble finished off the drive with a 3 yard touchdown run cutting Middleboro’s lead to 14-7 early in the second period. From there the Cobras took off, scoring the final 34 points of the game against a depleted Clinton defense. The Clinton offense was led by Ty Gamble. Gamble ran for 72 yards and added another 10 yards receiving. Duel-threat quarterback Josh Euglow completed 5 passes for 51 yards while also contributing 30 yards rushing on 5 attempts. Tight End Ernie Adams led all receivers with 4 catches for 41 yards. Linebackers Jamie Cairns and Josh Lowe played well for the defense. The pair combined for 13 tackles and 1 fumble recovery. The Irish Blizzard will return to action on Saturday September 10th as they travel to Doyle Field in Leominster for a game against the Twin City Blue Raiders. Kickoff is scheduled for 7pm. CLINTON-The Western Mass Blitzin’ Bears scored on the first three possessions of the game including a blocked punt for a touchdown while cruising to a 44-0 win over the Clinton Irish Blizzard. The Irish Blizzard did little to stop the Bears high powered aerial attack while the Western Mass defense pitched its second shutout in three weeks. With the win, the Bears improve to 5-1 on the season and remain atop the EFL’s West Division. The loss drops Clinton to 3-3 on the season. Ty Gamble was the lone bright spot for a Clinton offense that had its struggles all night. Gamble rushed for 31 yards on 8 carries and also had one reception. Luis Rodriguez led the defense with six tackles and a fumble recovery. Clinton will return home this week to face another elite opponent in the Middleboro Cobras. Kickoff is scheduled for 7pm at Fuller Field on Saturday night. CLINTON-Ty Gamble’s 130 yard rushing effort helped the Clinton Irish Blizzard post back to back wins for the first time in 2011 by defeating the Granite State Knights 34-14 on Saturday. With the win Clinton improves to 3-2 on the season. The Irish Blizzard offense scored 27 first half points opening up a commanding first half lead. Gamble led the way with 75 of his 130 rushing yards in the first half along with a rushing touchdown. Quarterback Carlos Vazquez had another solid outing. He completed 5 of 7 passes for 59 yards and two scores before giving way to Josh Euglow. Euglow added a pair of rushing touchdowns to close out the scoring. Tight End Ernie Adams led all receivers with 3 catches for 39 yards and one touchdown. Ryan Randall also hauled in a 32 yard scoring strike from Vazquez. Clinton got another steady effort from its defense. Cornerback Chris Nieves led the secondary by grabbing his team leading fourth interception. Defensive end Roger Blaikie recorded a pair of sacks. Linebackers David Flaherty and Luis Rodriguez combined for three tackles-for-loss and a fumble recovery. The Irish Blizzard returns to action on Saturday when they host the Western Mass Blitzin’ Bears (4-1). Clinton currently trails Western Mass by a game in the EFL’s Western Division. Kickoff is scheduled for 7pm at Fuller Field. CHARLESTOWN- The Clinton Irish Blizzard defeated the Charlestown Townies 17-6 on Saturday at Charlestown High School. Ty Gamble’s 90 yards rushing and one touchdown led a balanced Clinton Irish Blizzard attack. The Irish Blizzard also scored 10 points on special teams and forced 4 turnovers while improving their record to 2-2 on the season. The Irish Blizzard opened the scoring in the 2nd period with an 11 play 64 yard scoring drive. The drive culminated in a 27 yard touchdown pass to Ernie Adams from kicker Adam Maher on a fake field goal attempt. After a Charlestown score cut the lead to 7-6, the Irish Blizzard opened the second half with a scoring march that ended with Gamble’s 3 yard touchdown run. The touchdown extended Clinton’s lead to 14-6. The Irish Blizzard completed the scoring in the fourth quarter as Maher booted a 27 yard field goal sealing Clinton’s second road win of the season. Jon Davies, Jeff Learned, Stan Demesyeux, Jamie Cairns, and Brian Publicover were solid on the offensive line helping Gamble rush for 90 of Clinton’s 98 rushing yards on the afternoon. Quarterback Carlos Vazquez netted 105 passing yards in addition to Maher’s 27 yard fake field goal completion. Adams hauled in four catches for 74 yards and one score to lead all Clinton receivers. For the fourth consecutive week, the Irish Blizzard defense put forth a game effort. The unit forced four turnovers and held the Townies to six points. Safety Dave Flaherty led the way with eight tackles and an interception. Chris Nieves added his team leading third interception while Eric Arsenault also pulled down an interception. Defensive ends Luis Rodriguez, Josh Lowe, and Jeff Cross led the defensive front four with relentless pressure all afternoon. Maher was once again a standout on special teams. In addition to his first quarter touchdown pass, he remained perfect on the season connecting on a field goal and a pair of extra points. He also recorded one touchback. Clinton returns to action Saturday as the host Granite State at 7pm at Fuller Field. CLINTON – The Twin City Blue Raiders used a stingy defense and some timely offense to spoil the 2011 home opener for Clinton Irish Blizzard in front of a big crowd on Saturday night at Fuller Field. Clinton could only muster 111 yards of total offense on the night against the Twin City defense. The Irish Blizzard defense was nearly as impressive holding the Blue Raiders scoreless into the third period before finally yielding some points on a sweltering night at Fuller. The Clinton offense struggled to get much going in the first half as they were bothered by poor field position for most of the second quarter. The Irish Blizzard managed to put together some sustained drives in the second half but failed to convert on three fourth down attempts. RB Ty Gamble gave Clinton a spark at times as he contributed thirty yards on the ground. QB Ricky Joslin added another 10 rushing yards. Joslin completed five passes for 70 yards on the night. Receivers Mike Murray and Jim Learned each hauled in a pair of catches. The Irish Blizzard got another solid outing from its defense as the unit held the Blue Raiders scoreless into the third period. LB Justin Bailey led all tacklers 12 stops on the night. Brian Learned contributed 9 tackles, a forced fumble and an interception. CB Chris Nieves continued his solid play with a fumble recovery and an interception. CB Eric Arsenault added three pass breakups. The Irish Blizzard goes on the road this Saturday for a 5pm contest with the Charlestown Townies (Charlestown High School). Clinton will then return home for three consecutive home contests at Fuller Field. 7/16 GAME vs WESTERN MASS POSTPONED. LAWRENCE, MA –The Clinton Irish Blizzard scored 31 unanswered points over the final three quarters to post a 31-6 road victory over the Granite State Knights on Saturday. Clinton earns its first victory of 2011 improving to 1-1 on the season while Granite State drops to 0-2. Trailing 6-0 early in the second quarter, the Irish Blizzard engineered an impressive 86 yard, 10 play scoring drive. Ty Gamble capped off the drive with a one yard TD run giving Clinton a 7-6 lead. The next Clinton series saw quarterback Ricky Joslin connect on four passes before calling his own number scoring on a two yard TD run extending the Irish Blizzard lead to 14-6. Adam Maher then booted a 36 yard field goal to open the third quarter giving Clinton a 17-6 advantage. Following a Shawn Morin interception, Joslin quickly uncorked a 41 yard touchdown pass to Ryan Randall opening up Clinton’s lead to 24-6. The Irish Blizzard would complete the scoring with an eight play 41 yard fourth quarter drive. Workhorse running back Ty Gamble churned out 31 yards on the ground before Joslin hit Mike Murray on a 2 scoring strike. The TD pass gave Clinton a 31-6 lead which they made stand. Gamble and Joslin paced the Clinton Offense. Joslin finished 11 of 17 passing for 160 yards and two touchdowns. Gamble rushed for 119 yards and one touchdown on 19 carries. Randall led all receivers with 75 yards and one touchdown on 3 catches. Jim Learned added 47 receiving yards on three catches. Mike Murray pulled down four catches for 26 yards and one score. Tight end Steve Meyer hauled in one catch for 12 yards. Stan St. Juste, Jeff Learned, Jon Davies, Jay Berry, and TR Staake gave a strong effort on the offensive line. For the second consecutive week, the Clinton defense put forth a quality effort. Safety Morin’s interception highlighted a steady performance by the Irish Blizzard secondary. Safety Dave Flaherty and cornerbacks Eric Arsenault and Chris Nieves assisted Morin in the defensive backfield. Linebackers Jamie Cairns, Justin Bailey and Josh Lowe forced one fumble and were stout against the Knights attack. Luis Rodriguez, Roger Blaikie, Mark Monroe, Conor Philbin and Brian Publicover proved to be a formidable defensive line rotation. Placekicker Adam Maher was again spectacular as he kicked a 36 yard field goal, recorded two touchbacks on kickoffs and successfully converted four extra point attempts. Nate Vazquez and Carlos Vazquez were standouts on special teams. The Irish Blizzard return to action Saturday as they travel to Springfield to tangle with the Western Mass Blitzin Bears. Kickoff is scheduled for 7pm and American International College. WORCESTER-The Clinton Irish Blizzard football club opened the 2011 season with a lackluster effort as the Blizzard were shutout 21-0 by the Worcester Mass Fury in the regular season opener for both teams. Despite trailing 13-0 at halftime, the Clinton defense played well keeping the Irish Blizzard within striking distance most of the game. The Fury eventually put the game out of reach blocking a punt late in the fourth quarter and falling on it in the endzone to close out the scoring. The Clinton defense was led by linebackers Jamie Cairns and Justin Bailey. The pair combined for 14 tackles and one sack. Roger Blaikie and Brian Publicover anchored the defensive line while Chris Nieves led the secondary. Nieves recorded a third quarter interception that he returned 59 yards into Fury territory. The Blizzard were unable to capitalize on the return failing to convert a fourth down play. The Clinton offense struggled most of the day to dig out of bad field position. The Irish Blizzard failed to string together first downs and maintain drives. Credit the Fury defense that held the Clinton offense below 100 total yards for the game and yielded only two first downs in the first half. When Clinton did move the ball Dee Whitehead led the rushing attack netting 31 yards on the ground in the first half. Quarterback Ricky Joslin connected with targets Jim Learned, Mike Murray, and Ryan Randall. Learned led all receivers with 21 yards receiving on a pair of catches. The Irish Blizzard return to action on Saturday July 9th as they travel to Lawrence, Ma to faceoff against the Granite State Knights. Kickoff is scheduled for 3pm. Directions sent out via email. Congrats to Blizz veteran John Riccio in completing the 2011 Boston Marathon. NOTE: the Blizz will offer a series of voluntary workouts / events this spring for anyone looking to get out and get a jump on the 2011 season prior to the start of organized practices in later May. The goal of the sessions is to simply get guys together to have some fun and train together. The workouts will be in different locations. The workouts will be non-traditional training sessions geared at performance training and having fun after a LONG winter. Any interested players are invited. (More to come). **EFL OFFENSIVE PLAYER OF THE YEAR - Felix Borukhov (WR, Clinton Irish Blizzard) – Clinton Irish Blizzard receiver Felix Borukhov received the 2010 EFL Offensive Rookie of the Year Award. 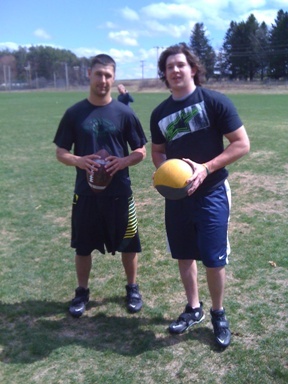 Borukhov had a season to remember for the Clinton Irish Blizzard, setting single season franchise records for receptions (57), yards (1059), and touchdown receptions (11) in 2010. A great showing of players, coaches, and supporters of the Clinton Irish Blizzard turned out on Saturday night (2/5) to look back at the 2010 season as well as look ahead to the 2011 season. The night of food, beverages, stories and camraderie culminated with the presentation of the 2010 Clinton Irish Blizzard Team Awards. Jeremy Frisch is owner and director of Achieve Performance Training in Clinton MA. He is the former assistant strength and conditioning coach for the Holy Cross athletic department. Where he worked directly with the Crusader mens basketball team, in addition to serving as the strength coach for Holy Cross' men's soccer, men's and women's lacrosse, baseball, softball, field hockey, tennis and women's track & field squads. Prior to joining Holy Cross, Frisch served as the sports performance director at Teamworks Sports Center in Acton, Mass., where he was responsible for the design and implementation of all strength and conditioning programs. He also served as a speed and strength coach for Athletes Edge Sports Training, and did a strength and conditioning internship at Stanford University. Frisch is a 2007 graduate of Worcester State College with a bachelor's degree in health science and physical education. He was a member of the football and track teams during his days at Worcester State and Assumption College. Should sportswriters be allowed to gamble on sports? Felix Borukhov (WR, Curry College) – Clinton Irish Blizzard receiver Felix Borukhov received the 2010 EFL Offensive Rookie of the Year Award. Borukhov had a season to remember for the Clinton Irish Blizzard, setting single season franchise records for receptions (57), yards (1059), and touchdown receptions (11) in 2010. TAUNTON- The Taunton Gladiators scored 20 fourth quarter points to rally past the Clinton Irish Blizzard and capture the 2010 EFL Championship. The Irish Blizzard held a 21-6 third quarter advantage before the Gladiators unleashed a furious comeback to end Clinton’s bid for back-to-back EFL titles. Clinton got on the board first as Scott Allard’s 33 yard run setup a Dee Whitehead 1 yard touchdown run. Adam Maher’s extra point gave Clinton a 7-0 first quarter lead. Taunton would eventually answer midway through the second quarter. The Gladiators converted a fourth and eleven situation with a touchdown pass. Following a failed extra point, the Irish Blizzard held a narrow 7-6 lead. Quarterback John Riccio completed four passes for 44 yards on Clinton’s next possession but a 37 yard field goal attempt by Maher missed by a narrow margin. The teams looked headed to the locker room with athe7-6 score but with 1:41 remaining until halftime Brian Learned intercepted a Taunton pass and returned all the way to the Taunton three yard line. A one yard Riccio TD run and Maher extra point sent the Irish Blizzard into halftime with a 14-6 lead. The teams would trade third quarter scores with the Irish Blizzard coming out of the break and marching 75 yards in nine plays. Whitehead and Ricky Joslin combined for 33 rushing yards on the drive before Riccio found Felix Borukhov on a 28 yard touchdown pass. Maher’s extra gave Clinton a commanding 21-6 third quarter lead with 7:11 left in the third quarter. The Gladiators answered four minutes later on a 2 yard touchdown run cutting the deficit to 21-12. The fourth quarter belonged to Taunton. The Gladiators would strike with three big plays in the fourth quarter to sink Clinton. The Gladiators scored on an 80 yard touchdown pass, a 60 yard touchdown run and a 32 yard touchdown run on consecutive possessions to storm past the Irish Blizzard and earn their first EFL Championship. Clinton’s offense was led by its rushing attack. Whitehead, Allard, Joslin, and Riccio combined for 138 rushing yards and two scores against the EFL’s top ranked defense. Stanley St. Juste, Jeff Learned, Brandon Beach, Jon Davies, Steve Meyer and A. J. Crane opened holes on the offensive line. Riccio and Borukhov paced the passing attack hooking up 5 times for 92 yards and one score. Outside linebacker Brian Learned’s interception highlighted the defensive effort. Cornerbacks Ronnie Guyton and Dave Claiser combined for three pass breakups. Luis Rodriguez had a sack at defensive end. With the win Taunton finishes the 2010 season with a 12-2 record. Clinton, making their third straight championship game appearance, finishes 11-3 with the defeat. Former Irish Blizzard WR Matt Surette (2005-2008) was diagnosed with Acute Myeloid Leukemia earlier this summer, and on September 17th received a bone marrow transplant. Matt was the team's leading receiver and offensive MVP in 2005. He got off to a quick start to the 2006 season before being sidelined with a knee injury in week 3. Matt returned late in the 2007 season to record 4 TD receptions in the final 2 games of the season. Surette would play 5 games in 2008 recording 5 TD receptions and leading the team in several categories before finally retiring due to recurring knee problems. Matt Surette had an amazing college career at WPI. Matt was a two-time All-American for the Engineers and in 2006 was inducted into the WPI Hall of Fame. Matt holds virtually every receiving record at the university, including career standards in catches (165), receiving yards (2,588), and touchdown receptions (26). In addition, he had the finest performance by a TE in the history of Division III football by hauling in 17 catches for and eye-popping 362 yards on October 17, 1997 against Springfield College. GAME NOTES: The Clinton Irish Blizzard attempt to defend their 2009 EFL championship as they travel to Taunton to face off against the Taunton Gladiators in the 2010 EFL title game. Clinton makes its third consecutive championship game appearance and fourth overall in the team’s 11 year history. Taunton is playing in its first EFL championship game in just their 2nd year as a franchise. Clinton defeated the number one seeded Western Mass Blitzin Bears 10-6 on the road last week. Taunton upended the third seeded Boston Ravens by a score of 7-6 at home last week. Taunton and Clinton met in week one of the EFL season and it was Taunton that prevailed by a 14-7 score. Clinton finished the regular season as the EFL’s top scoring team (359 pts, 32.6 ppg). Taunton finished the season as the top ranked defense in the EFL (101 points allowed, 9.2 ppg). Clinton and Taunton enter the game with identical 11-2 records. Clinton has a 5 gave winning streak coming into the final. Taunton has won four games in a row. Taunton has allowed 14 points in two playoff games this season. Clinton has allowed 12 points. The Marlboro Shamrocks have won 19 EFL titles. The Middleboro/Mitchell Club Cobras have won eight EFL titles. The Hyde Park Cowboys have won three EFL titles. The Albany Metro Maulers are the only team from outside of New England to win an EFL championship. Albany won EFL titles in 1981 and 1986. Clinton quarterback John Riccio surpassed 2000 yards passing for the season in last week’s semifinal win. Irish Blizzard cornerback Ronnie Guyton has an interception in both of Clinton’s playoff games. Clinton kicker Adam Maher has made field goals of 40 yards or more in consecutive playoff games. Clinton's Dee Whitehead has scored rushing touchdowns in each playoff game. He has a team high 15 rushing touchdowns this season. Whitehead has at least one rushing touchdown in every game he’s played except in the week one loss to Taunton. The Irish Blizzard have forced 8 turnovers in two playoff wins. Clinton's Felix Borukhov tied a season high with 8 catches last week vs Western Mass. SPRINGFIELD- The Clinton Irish Blizzard return to the Eastern Football League Championship game by virtue of a 10-6 semifinal road win over the number one seeded Western Mass Blitzin Bears. It will be the third consecutive trip to the championship game for the Irish Blizzard who defeated the Quincy Miltia in last year’s title game. The Irish Blizzard were powered by a stingy defense and some timely offense while holding on for the road win over the Blitzin Bears. Clinton and Western Mass combined for 72 points in a 38-34 Irish Blizzard victory just three weeks ago. The same two teams met Saturday night and while the result was the same, defense ruled the day this time around. Clinton’s first half consisted of three drives, two of which stalled in Western Mass territory. Meanwhile, the Irish Blizzard defense forced a three-and-out series, a turnover on downs and cornerback Ronnie Guyton intercepted a Shawn Brady pass before halftime as the teams went into the locker room 0-0 at halftime. Beginning the second half, the Irish Blizzard marched 46 yards over 11 plays before missing a 37 yard field goal. Scott Allard and Dee Whitehead combined for 22 yards rushing on the drive. The Clinton defense then created a turnover at midfield as Mike McGonagle and Dave Flaherty forced a fumble that was recovered by the Irish Blizzard and the offense was back at work. Quarterback John Riccio completed 5 passes on an 11 play 50 yard scoring drive. Riccio would eventually find Bryan Sullivan on a key completion down to the one yard line. Two plays later Dee Whitehead plowed in from one yard out giving the Irish Blizzard a 7-0 lead with just 0:50 remaining in the third period. Clinton continued to hold the Blitzin Bears in check forcing consecutive three-and-out series. Riccio went to the air again finding Felix Borukhov for completions of 26 yards and eight yards setting up an Adam Maher 41 yard field goal attempt. Maher drilled the kick extending Clinton’s lead to 10-0 with 8:28 left to play in the 4th period. The Bears found life and responded with a scoring drive taking only 1:24 off the clock. A Brady touchdown pass and failed extra point cut the Irish Blizzard lead to 10-6. Two plays later a Riccio pass was deflected at the line of scrimmage and intercepted. The Bears would drive down the Clinton 4 yard line and looked to be in the driver’s seat with a first and goal. The Irish Blizzard defense answered the bell. A key Gareth Watts second down tackle followed by consecutive pass breakups by Guyton and Dave Claiser stoned the Bears’ attempt to take the lead. The Clinton offense took over needing a pair of first downs to seal the win. Allard went to work carrying four times for 29 yards allowing the Irish Blizzard to run down the clock on the big semifinal win. For the offense, Brandon Beach, Jon Davies, Steve Meyer, AJ Crane, Jeff Learned, and Stanly St. Juste did great work on the offensive line. Allard and Whitehead combined for 86 rushing yards and one score. Riccio completed 14 passes for 134 yards. Borukhov had a big game hauling in 8 catches for 84 yards. Defensively, the Irish Blizzard were terrific all evening holding the second ranked scoring offense in the EFL to just six points. The secondary led the way with Guyton, Claiser, Chris Leblanc, and Watts providing blanket coverage most of the night. 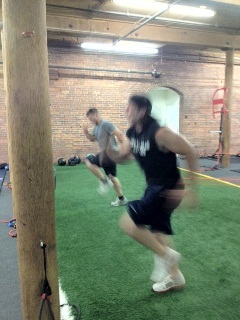 Linebackers McGonagle and Flaherty teamed with Alejandro Miranda and Brian Learned to hold the Bears run game in check. Roger Blaikie, Luis Rodriguez, Jamie Cairns, Stanley Denesyeux and Brian Publicover anchored the defensive line. Rodriguez had a sack while Blaikie and Publicover deflected passes. CLINTON- The Clinton Irish Blizzard advanced to the EFL Semifinals with a convincing 24-6 quarterfinal victory over the Charlestown Townies on Sunday. Quarterback John Riccio ran and threw for a touchdown while Dee Whitehead ran for another score. Adam Maher added a forty yard field goal to help send Clinton into the EFL semifinals for the third straight year. Clinton (10-2) will now face the Western Mass Blitzin Bears (11-1) for the right to advance to the EFL championship game. The Irish Blizzard got on the board midway through the first period. Whitehead carried five times during an eight play 56 yard scoring drive. Whitehead did the honors plunging in from one yard out sending Clinton to a 7-0 lead. Early in the second period, a Chris Leblanc interception set up a 40 yard Maher field goal giving the Irish Blizzard a 10-0 advantage. The Clinton offense continued to roll on their very next possession moving the ball 65 yards over eight plays. Riccio did damage through the air completing four passes for 30 yards including a two yard touchdown toss to Ernie Adams. Adams’ score sent the Irish Blizzard into halftime with a 17-0 lead. Townies finally made some noise in the third quarter on a Jon Jones touchdown pass shrinking the Clinton lead to 17-6. The Irish Blizzard ended any hope of a Charlestown comeback with a nine play scoring march. Whitehead and Scott Allard combined for five carries during the drive. Riccio capped off the drive with a one yard touchdown run closing out the scoring and giving the Irish Blizzard the 24-6 lead. The Clinton defense was active all night forcing four turnovers and holding the high scoring Townies offense to six points. Leblanc and Ronnie Guyton picked off passes. Leblanc and Roger Blaikie notched fumble recoveries forced by Luis Rodriguez and Brian Learned. David Claiser chipped with two pass breakups. Offensive linemen Stanley St. Juste, Jeff Learned, Brandon Beach, Jon Davies, Steve Meyer, and A. J. Crane were terrific controlling the line of scrimmage. Their work helped Whitehead, Allard, and Ricky Joslin combine for 125 yards rushing. Riccio got ample time in the pass game completing 11 of 18 pass attempts for 137 yards and one score. Adams led all receivers with three catches and one touchdown reception. Lorin Reed, Whitehead, and Jim Learned each contributed a pair of catches. Maher’s 40 yard field goal highlighted a great all-around special teams effort. Josh Lowe recovered a fumble on kickoff coverage. Allard and Ryan Aldrich picked up key special teams tackles. Chris Nieves was spectacular retunring punts and kickoffs. CLINTON- Quarterback John Riccio scored on a 5 yard touchdown run with 0:16 left to play as the Irish Blizzard pulled out a thrilling 38-34 win over the previously unbeaten Western Mass Blitzin Bears. With the win Clinton closes out the regular season with a 9-2 record while the Blitzin Bears fall to 9-1. The Irish Blizzard jumped out to an early 10-0 lead on Western Mass. Safety Chris Leblanc’s interception set up a John Riccio to Lorin Reed 23 yard touchdown pass. Kicker Adam Maher followed that up with a 23 yard field goal on the next possession staking Clinton to a 10-0 lead. Western Mass responded scoring 20 second quarter points to take a commanding 20-10 lead. The Irish Blizzard then ripped off a 5 play 72 yard drive to score with 0:21 left in the half. On the drive, Riccio completed 4 passes for 52 yards including a 20 yard scoring strike to Felix Borukhov to cut the Bears lead to 20-17 going into halftime. The second half saw both teams exchanging scores over the final thirty minutes. Clinton opened the half with a 54 yard scoring drive. Ernie Adams hauled in a 5 yard touchdown pass from Riccio and the Irish Blizzard retook a 24-20 lead. Western Mass answered reclaiming a 28-24 lead going into the fourth quarter. Dee Whitehead capped another Clinton scoring drive by taking a fourth-and-two handoff and converting it into a 19 yard touchdown run giving Clinton a 31-28 fourth quarter lead. The Irish Blizzard would eventually face a 34-31 deficit with 1:55 remaining in the game. With a first and ten at their own 22 yard line, a 17 yard completion to Reed sandwiched between completions of eight and 11 yards to Borukhov advanced the ball to the Bears 38 yard line with under a minute to play. A nine yard completion to Jim Learned followed a pass interference penalty moving the Irish Blizzard down to the fourteen yard line. Whitehead carried for nine yards down to the five yard line setting up the winning score. On the ensuing play, Riccio rolled out and tucked the ball and scrambled 5 yards for the go-ahead touchdown. Riccio’s scoring run with 0:16 remaining sealed a hard fought 38-34 win for Clinton. On the day Riccio completed 22 of 39 passes for 277 yards and three passing touchdowns in addition to the rushing score. Borukhov led all receivers with eight catches for 128 yards and one touchdown. Reed and Adams each caught five passes and one touchdown. Whitehead carried for 49 yards and one score while Scott Allard gained 39 yards on six carries. Defensively, Chris Leblanc led the secondary with an interception that set up an early score. Alejandro Miranda led the linebackers with 8 tackles and Dave Flaherty recovered one fumble. Luis Rodriguez had a sack and a forced fumble to lead the defensive line effort. The Irish Blizzard will host a quarterfinal playoff game the weekend of October 2nd. Details will be announced shortly. BELFAST- The Clinton Irish Blizzard scored 41 first half points while cruising to a 41-6 win over the Mid-Coast Falcons on Saturday. The Irish Blizzard got scoring contributions from the offense, defense, and special teams while sprinting out to a 41-0 halftime lead. Scott Allard led the attack rushing for 108 yards and two first half scores. Ronnie Guyton and Dave Claiser each returned second quarter punts for touchdowns. 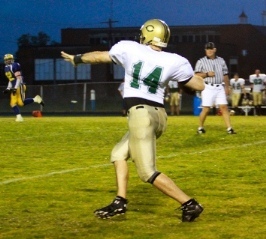 Clinton received the opening kick and Scott Allard took a handoff on the first play from scrimmage and raced 53 yards. Two plays later quarterback John Riccio hit Felix Borukhov on a 10 yard scoring strike to give Clinton a 7-0 lead. The Irish Blizzard defense next came up with a big play as free safety Chris Leblanc stormed the backfield on a blitz dropping the Falcons quarterback in the endzone for a safety and a 9-0 lead. Clinton’s ensuing possession mirrored their first, taking only three plays to score. A 25 yard Riccio to Ernie Adams completion set up a 25 yard touchdown burst by Allard extending the Clinton lead to 16-0. Following another defensive stop, Riccio hit Lorin Reed on a 15 yard pass play setting up a 2 yard touchdown run by Dan Peete. Peete’s score capped off a 23 point first quarter. The second quarter featured another Allard touchdown run sandwiched between punt return touchdowns. An Allard 12 yard touchdown run was preceded by cornerback Ronnie Guyton’s 53 yard punt return. Cornerback Dave Claiser then closed out the half with an 82 yard punt return sending the Irish Blizzard into the lockeroom with a 41-0 halftime lead. Great defensive play continued in the second half as both starters and reserves made sure the lead would stand. Safety Gareth Watts, linebacker Josh Lowe and reserve defensive back Jeremy Labbe each nabbed interceptions. Linebacker Alejandro Miranda and defensive end Roger Blaikie were stout against the run. Defensive ends Brian Publicover, Luis Rodriguez, and Dwayne Forbes applied constant pressure. Allard led the offense with a 108 yard, two touchdown effort. Dan Peete rushed for 94 yards and one score while brother Dave Peete chipped in with 13 rushing yards. Riccio and Dave Peete combined for 6 of 9 passing for 70 yards and one touchdown pass. Bryan Sullivan led all receivers with a pair of catches while Borukhov hauled in the first quarter touchdown. The Irish Blizzard will close out the regular season by hosting the 9-0 Western Mass Blitzin Bears on Saturday. Kickoff is scheuled for 2pm at Fuller Field. QUINCY- In their first meeting since the 2009 EFL title game, the Clinton Irish Blizzard and Quincy Militia tangled in a key EFL matchup last Saturday. It was Clinton that came away with an important road win as the Irish Blizzard built a 24-7 lead and held on for a 24-21 victory. Clinton and Quincy entered the game tied in the standings. With the win the Irish Blizzard improves to 7-2 while the Militia falls to 6-3. Adam Maher staked Clinton to an early 3-0 advantage with a 34 yard field goal. Quincy would answer right back with an 89 yard touchdown pass to assume a 7-3 lead. The Irish Blizzard offense began to roll at this point. John Riccio’s 20 yard completion to Felix Borukhov setup a 5 yard scoring strike to Jim Learned. Maher’s extra point gave Clinton a 10-7 lead. Clinton’s next possession saw Dee Whitehead cap off a 12 play scoring drive with a 13 yard touchdown run. Whitehead, Ricky Joslin, and Ryan Aldrich combined for 57 yards rushing on the drive. Maher’s extra point sent the Irish Blizzard into halftime with a 17-7 advantage. Safety Gareth Watts put Clinton in great position later as he intercepted a Quincy pass and returned it 59 yards. Three plays later Riccio hit Borukhov from 3 yards out making it a 24-7 Clinton lead with 5:27 left in the third quarter. Quincy suddenly found life scoring on back to back possessions cutting the Irish Blizzard lead to 24-21 with 5:23 left in the game. At this point, Clinton’s defense rose to the challenge. They stopped Militia on consecutive possessions in Clinton territory. With 0:57 left to play, Quincy’s final attempt at a game tying, 34 yard field goal sailed wide left giving the Irish Blizzard a hard fought 24-21 road win. Whitehead led the offense with 88 yards rushing and the one score. Borukhov led all receivers with three catches for 57 yards and one touchdown. Learned hauled in Riccio’s other touchdown pass. The offensive line of Stanley St. Juste, Steve Meyer, Jeff Learned, Jon Davies, and Jay Berry allowed Clinton backs to rush for 122 yards on the night. The Clinton defense came up big as they got key stops when needed including two final stops to preserve the win. Brian Publicover, Jamie Cairns, Luis Rodriguez, Roger Blaikie, Stanley Demesyeux, and Dwayne Forbes all saw time on the defensive line and played well up front. Linebackers Brian Learned, Dave Flaherty, Alejandro Miranda, and Alex Mitchell were stout in the middle. McGonagle led the linebackers with two tackles for loss. Watts led the secondary unit with his team leading fifth interception. He was aided by Dave Claiser, Ronnie Guyton, Chris Leblanc, Matt Guimond, and Chris Nieves who all contributed in the secondary. CLINTON – The Boston Ravens forced three costly turnovers and converted two of those turnovers into ten points en route to a 24-15 victory over the Clinton Irish Blizzard. The loss snaps the Irish Blizzard six game win streak and drops Clinton to 6-2 on the season. The Ravens improve to 7-2 with the win. Trailing 7-0 after one period, a nine play, 61 yard Clinton drive yielded three points on an Adam Maher 28 yard field goal cutting the Boston lead to 7-3. The Irish Blizzard saw the second quarter deficit reach 14-3 before quarterback John Riccio went to work. Riccio completed four of six passes on a drive that culminated in a 10 yard touchdown pass to Felix Borukhov. A failed conversion kept the Ravens lead at 14-9 going into halftime. Trailing 17-9 early in the fourth period Riccio and Borukhov connected on a 32 yard passing play setting up a three yard touchdown scamper by Dee Whitehead. The drive featured a combined 25 rushing yard from Whitehead and Scott Allard. Riccio’s two point conversion pass to Ernie Adams was broken up by the Ravens secondary preserving their slim 17-15 fourth quarter lead. Boston put a dagger in the heart of the Irish Blizzard answering right back with an extended drive that finished with a third down scoring pass increasing their lead to 24-15 with 8:16 left to play. Needing two scores, Clinton drove past midfield before a forced fumble by the Ravens defense all but sealed the win for Boston. On the night Riccio completed 11 passes for 130 yards and one score. Borukhov led all receivers with 5 catches for 79 yards and one score. Whitehead was Clinton’s leading rusher with 48 yards and one touchdown on the ground. Fullback Ricky Joslin added 26 yards rushing. The defense got solid secondary play from Ronnie Guyton, Chris Leblanc, Chris Nieves, and Gareth Watts. Watts notched a key second quarter interception while linebacker Dave Flaherty also snagged an interception. Fellow linebacker Alex Mitchell recorded a fumble recovery. Brian Publicover, Jamie Cairns, and Stanley Demesyeux played well on the defensive line. The Irish Blizzard (6-2) return to action Saturday as they travel to Quincy (6-2) to face off with the Militia. Kickoff is scheduled for 7pm at Veterans Memorial Stadium. CLINTON – The Clinton Irish Blizzard won a seesaw battle with the Charlestown Townies with a 26-20 overtime win on Saturday night. Clinton squandered a 13-0 first half lead, falling behind 20-13 in the fourth quarter, before tying the game late and eventually winning on a Dee Whitehead 25 yard overtime touchdown run. With the win, Clinton improves to 6-1 while Charlestown falls to 5-3. Clinton got on the board early in the second quarter. Following a Gareth Watts interception quarterback John Riccio connected with Lorin Reed on a 38 yard touchdown pass giving the Irish Blizzard a 6-0 lead. Clinton followed up their first score with a 10 play 63 yard drive. Ryan Aldrich finished off the drive with a 4 yard scoring run extending the Irish Blizzard lead to 13-0. The Townies seized momentum just before the half. A four yard touchdown run with six seconds left in the half cut the Clinton lead to 13-6. Charlestown scored again midway through the third period taking the lead 14-13 following a successful two-point conversion. The Townies extended that lead to 20-13 early in the fourth period on a fourth down scoring pass. The Irish Blizzard tried to answer going on a 9 play 57 yard drive before stalling out on the Charlestown nine yard line with 4:46 left in regulation. Following a three-and-out series from the Townies, Clinton free safety Chris Leblanc blocked the Townies punt attempt and Roger Blaikie fell on it in the end zone suddenly tying the game 20-20 with 2:16 left in the fourth period. The Irish Blizzard got one more possession in regulation. Riccio uncorked a 55 yard pass to Reed setting up a game winning field goal attempt. The Townies blocked the 30 yard attempt sending the game into overtime. With alternating possessions in effect, Charlestown took the first possession in overtime starting at the Clinton 25 yard line. The defense got big stops on short yardage plays on third down and fourth down. Brian Publicover’s fourth down sack held the Townies scoreless on their first possession. The Irish Blizzard needed only one play to close out the game. Dee Whitehead took a handoff and darted 25 yards to pay dirt giving Clinton the 26-20 overtime win. Whitehead paced the offense with a 101 yard rushing effort and one touchdown. Aldrich chipped in with 22 yards and a touchdown. Riccio ran for 32 yards but did most of his work through the air. He completed 14 of 27 passes for 193 yards and one score. Jim Learned and Felix Borukhov led all receivers with four catches. Reed added 93 receiving yards on two receptions including one score. Stanley St. Juste, Jon Davies, Jeff Learned, Jay Berry, Steve Meyer, and John McLaughlin blocked well up front. The Clinton defense was terrific in all phases against a prolific Charlestown offense. The defensive line was led by Publicover and Brandon Beach. The pair combined for a sack and four tackles-for-loss. Brian Learned led all tacklers and got great support from fellow linebackers Mike McGonagle, Dave Flaherty, and Alex Mitchell. Dave Claiser, Ronnie Guyton, Leblanc, Watts, and Chris Nieves all performed admirably in the secondary. Watts and Nieves each recorded an interception. Leblanc notched the big fourth quarter punt block that tied the game. The Irish Blizzard (6-1) remain at home next week hosting the Boston Raven (6-2). Kickoff is scheduled for 7pm at Fuller Field. BRAINTREE- The Clinton Irish Blizzard picked up their third straight road win and fifth consecutive victory overall with a 30-6 win over the Braintree Cowboys on Saturday. With the win, the Irish Blizzard improves to 5-1 and return home to host the 5-2 Charlestown Townies on Saturday. Clinton jumped out to a 14-0 first quarter advantage on consecutive scoring drives to open the game. Dee Whitehead’s 9 yard touchdown run followed by a 1yard scoring plunge by John Riccio staked the Irish Blizzard to a quick 14-0 lead. Clinton threatened once more before halftime as the Irish Blizzard faced a 3rd and goal from the 13 yardline. Riccio found Felix Borukhov on a key third down scoring strike sending Clinton to the lockeroom with a 20-0 halftime advantage. The Irish Blizzard mounted scoring drives in each of the final two quarters. After pinning the Cowboys deep in their own territory for much of the third quarter, Clinton assumed possession on the Braintree 31 yardline with 3:42 left in the quarter. It took the Irish Blizzard just four plays before Riccio and Ernie Adams hooked up for a 4 yard touchdown pass extending Clinton’s lead to 27-0. Adam Maher got into the act booting a 31 yard field goal with 5:49 remaining in the fourth quarter, capping off a 9 play scoring drive. The field goal made it 30-0 before the Cowboys engineered a scoring drive on the final possession of the game making the final score 30-6. The offense was led by Riccio who finished 15 of 27 passing for 171 yards and two scores. Borukhov led all receivers with six catches for 88 yards and one touchdown. Adams also added the third quarter touchdown catch. Whitehead’s 56 rushing yards and one touchdown paced Clinton’s rushing attack. The defense continued its run of stingy play yielding only 6 fourth quarter points and averaging 6.7 points per game allowed over the first six games. Clinton got great play from its Linebackers on Saturday. Mike McGonagle’s first quarter fumble recovery set up an early touchdown. Alejandro Miranda and Dave Flaherty racked up tackles highlighted by a big hit in the backfield by Miranda on a third and short play in the third quarter. Clinton will return home this Saturday for a key showdown with the Charlestown Townies (5-2). Kickoff is scheduled for 7pm at Fuller Field in Clinton. EASTON – The Clinton Irish Blizzard picked up their fourth straight victory with a 34-0 road win over the Bay State Bucs on Friday night. Clinton got contributions from all areas as the offense racked up two rushing touchdowns and a passing touchdown while the defense posted a shutout and scored on an interception return. Place kicker Adam Maher booted field goals of 39 yards and 30 yards in addition to converting four extra points and booming three touchbacks on kickoffs. Cornerback Dave Claiser got things rolling for the Irish Blizzard picking off a Bucs pass on the third play from scrimmage and returning it 40 yards for a touchdown staking Clinton to an early 7-0 lead. The Clinton offense followed up Claiser’s score with a 10 play scoring drive on their first possession. Scott Allard finished things off with a two yard touchdown run extending the Irish Blizzard lead to 14-0. Maher then drilled two second quarter field goals to send Clinton into the lockeroom with a 20-0 halftime lead. The second half proved to be more of the same as the stingy Clinton defense continued to hold Bay State scoreless allowing the offense to control the ball and put the game out of reach. A 22 yard completion from John Riccio to Lorin Reed set up a four yard, third quarter touchdown run by Dee Whitehead. Riccio wasn’t done, finding Felix Borukhov for completions of 24 yards and 15 yards preceding an eight yard touchdown pass to Mike Murray for a 34-0 fourth quarter advantage. The Irish Blizzard defensive effort was highlighted by four forced turnovers. Claiser led the way with a pair of interceptions including the first quarter return for touchdown. Gareth Watts also notched an interception coming off a deflected pass by cornerback Ronnie Guyton. Linebacker Alex Mitchell chipped in with a fumble recovery that led to a second quarter field goal. Stanley St. Juste, Jay Berry, Jeff Learned, Josue Diaz, and Jamie Cairns anchored the offensive line. Allard, Whitehead, and fullback Ricky Joslin combined for 106 rushing yards and two touchdowns to pace the Clinton ground attack. Riccio finished a highly efficient 16 of 23 passing for 156 yards and one touchdown including six straight completions in the second half. Seven different receivers caught passes as Borukhov led all receivers with four catches for 67 yards. Murray also contributed four catches including the fourth quarter touchdown reception. Clinton’s special teams were highlighted by place kicker Maher who had a huge night converting all four extra points and each of his two field goal attempts (39 and 30 yards). He also exhibited a powerful leg on kickoffs as three resulted in touchbacks. The Irish Blizzard remain on the road for one more week, visiting the Braintree Cowboys on Saturday. Kickoff is scheduled for 3:30pm at Archbishop Williams High School. RANDOLPH- Quarterback John Riccio threw for 298 yards and 3 touchdowns to lead the Clinton Irish Blizzard to a 34-14 win over the Randolph Oilers on Friday night. Clinton has now won three games in a row and will enter their bye week with a 3-1 record. Riccio completed passes to six different receivers but Felix Borukhov emerged as his favorite target hauling in seven catches for 235 yards and three touchdowns. The Irish Blizzard also got a touchdown run from Dee Whitehead and a fourth quarter punt return touchdown from Chris Nieves. Clinton built a 20-0 second quarter lead as Riccio and Borukhov connected on touchdown passes of 65 and 61 yards before Dee Whitehead scampered in from 9 yards out padding the Clinton lead going into the half. Randolph refused to quit, twice cutting into Clinton’s lead as they closed the gap to 20-7 in the third quarter. Chris Nieves answered with a 65 yard punt return for a touchdown extending the lead to 27-7. It was Nieves’ third punt return for touchdown in the last two games. The Oilers again scored cutting the lead to 27-14 midway through the fourth. Riccio and Borukhov sealed the deal with a 51 yard touchdown pass with 4:16 remaining in the fourth quarter. The offense was led by Riccio and Borukhov. Aside from Borukhov’s dazzling effort, Riccio also completed single passes to Mike Murray (24 yards), Ernie Adams (9 yards), Whitehead (7 yards), Jim Learned (15 yards) and Ryan Randall (8 yards). Whitehead paced the rushing attack with 81 yards and one touchdown. Fullback Ricky Joslin added 26 yards on the ground. The defense was led by a front seven that shut down Randolph’s rushing attack. Forced to throw, the Irish Blizzard secondary was up to the challenge. Dave Claiser contributed four pass breakups from his cornerback position while the other cornerback, Ronnie Guyton, added an interception. Linebackers Alex Mitchell, Alejandro Miranda and Mike McGonagle all played well. McGonagle notched a fourth quarter interception. Up front, Luis Rodriguez recorded two sacks from his defensive end position. Clinton will next see action on Friday August 6th as they travel to Easton to tangle with the Bay State Bucs. Kickoff is set for 7:30pm at Oliver Ames High School. CLINTON – The Clinton Irish Blizzard scored 33 first half points while cruising to a 40-6 victory over the Granite State Knights on Saturday night. Clinton’s defense compiled its third straight impressive performance, holding the Knights scoreless until the final minutes of the 4th quarter. With the win the Irish Blizzard improve to 2-1. The loss drops Granite State to 1-2 on the season. Chris Nieves turned in a spectacular special teams performance returning two first quarter punts for touchdowns (48 yards and 57 yards). For the second consecutive week, running back Dee Whitehead led the offense with three touchdown runs (10 yards, 3 yards, 1 yard). Whitehead finished with 76 yards rushing on 9 carries. Quarterback John Riccio finished 5 of 8 passing for 101 yards and one touchdown in light duty. Felix Borukhov led all receivers with 2 catches for 67 yards and one touchdown. For the third consecutive week, the Irish Blizzard defense held the opposing offense to one touchdown or less. Linebacker Josh Lowe and Cornerback Ronnie Guyton each recorded first half interceptions that set up Clinton scores. Defensive linemen Jamie Cairns, Brian Publicover, Luis Rodriguez, and Stanley Demesyeux, were dominant up front as the Irish Blizzard controlled the line of scrimmage all evening. Clinton returns to action Friday night as the Irish Blizzard travel to Randolph to faceoff with the Randolph Oilers. Kickoff is schedule for 8pm at Randolph High School. CLINTON – The Irish Blizzard scored 23 second quarter points to help bury the Hyde Park Seminoles 30-0 in the 2010 home opener at Fuller Field. Clinton got three touchdown runs from Dee Whiethead to lead the offensive attack. The defense posted its first shutout of 2010 while getting interceptions from Alejandro Miranda, Dave Claiser, and Gareth Watts. Prior to kickoff, State Representative Harold Naughton, State Senator Jennifer Flanagan, and Town Administrator Michael Ward took part in a brief ceremony to honor Clinton’s 2009 EFL Championship team. Clinton’s second possession sparked its offensive attack as John Riccio connected with Felix Borukhov on a 29 yard pass completion on a key 3rd and 18 play. Two plays later, Whitehead sprinted to paydirt from 5 yards out and the Irish Blizzard led 7-0 early in the second quarter. Following an Adam Maher 28 yard field goal that extended Clinton’s lead to 10-0, Irish Blizzard cornerback Claiser pulled down an interception and raced 40 yards giving the Irish Blizzard great field position. Riccio immediately hit tight end Ernie Adams for 21 yards and fullback Ricky Joslin for 8 yards before Whitehead scored on a 1 yard touchdown run giving Clinton a sudden 17-0 lead. Clinton’s final possession of the half would yield more points. A 14 yard Scott Allard run followed by a pair of completions to Mike Murray and one to Jim Learned landed the Irish Blizzard at the two yardline. A one yard touchdown plunge by Whitehead capped off a 23 point second quarter after Clinton’s extra point was blocked by the Seminoles. The Irish Blizzard defense continued to stifle Hyde Park as Clinton’s offense put the game out of reach in the third quarter. A 49 yard Whitehead scamper was followed by a 9 yard Joslin run giving the Irish Blizzard possession at the Seminoles’ 17 yardline. Riccio then went to the air and found Borukhov from 17 yards out closing out the scoring and giving the Irish Blizzard a comfortable 30-0 third quarter lead. The defense would make the lead stand while holding the Seminoles scoreless over the final quarter and recording the shutout. The Irish Blizzard got solid line play out of Jeff Learned, Jay Berry, Nate Orcutt, Jon Davies, T. R. Staake, and Josue Diaz. The offense was led by Whitehead’s 93 rushing yards and three touchdowns. Allard racked up 55 yards rushing while Joslin chipped in with 16 yards on the ground. Riccio finished 11 of 21 passing for 164 yards, one touchdown and no interceptions. Adams led all receivers with three catches for 39 yards. Borukhov (46 yards and 1 touchdown), Jim Learned (30 yards), and Murray (12 yards) each pulled in two receptions. The stingy Clinton defense was led by its secondary unit. Claiser (interception), Watts (interception), Chris Leblanc, Ronnie Guyton, and Chris Nieves all played well in the defensive backfield. Dave Flaherty and Miranda (interception) had standout games at linebacker while Brian Publicover and Jamie Cairns led the defensive line play. The Irish Blizzard remain home next week as they host the Granite State Knights (1-1). Kickoff is set for 7pm Saturday at Fuller Field. LAWRENCE – Returning two of the top three statistical defenses from 2009, Clinton and Taunton squared off in what expected to be a defensive struggle. The season opener for both teams met expectations as a third quarter defensive touchdown by Taunton was enough to edge Clinton 14-7 in a tight defensive struggle. Facing relentless pressure, quarterback John Riccio led the offense finishing 15 of 29 passing for 203 yards and 1 touchdown in a game effort. Safety Matt Guimond recorded a fumble recovery for a Clinton defense that was terrific all evening. After a scoreless first period that included an 8 play drive by the Irish Blizzard, Taunton struck first. The Gladiators capitalized on a 45 yard run and a personal foul penalty to take a 7-0 lead midway through the second quarter. The Irish Blizzard answered immediately with Riccio connecting on a 44 yard touchdown strike to Ryan Randall tying the game at 7-7. Clinton missed a golden opportunity late in the half. A Matt Guimond fumble recovery gave the Irish Blizzard a first down on the Gladiators 11 yard line. The Irish Blizzard gambled on a 4th and 3 play from the four yard line and came up short. The score remained 7-7 at halftime. Coming out of the half, the Irish Blizzard drove 37 yards in five plays highlighted by completions of 14 yards and 17 yards to Scott Allard and Felix Borukhov. With a 1st and 10 from the Taunton 28 yard line, Riccio was picked off at the 18 yardline and Tauton returned the interception 82 yards for a touchdown giving them a 14-7 third quarter advantage. The Irish Blizzard could only threaten once more in the fourth quarter. A nine play drive highlighted by a 16 yard Dee Whitehead run and a 30 yard completion to Ernie Adams landed Clinton at the Taunton 21 yardline. Clinton failed to convert another 4th and 2 situation and the Irish Blizzard were stopped on downs by an opportunistic Gladiators defense. Taunton would go on to stop Clinton’s final three possessions and hold on for the 14-7 win. The offense was led by its passing game. Adams (3 receptions / 62 yards), Borukhov (4/46), Randall (2/44, 1TD), Allard (2/25), Lorin Reed (2/8), and Mike Murray (2/18) all recorded multiple catches. The defense was solid, limiting the Gladiators offense to one touchdown on the evening. Luis Rodriguez led the front four with a sack and a tackle-for-loss. Mike McGonagle paced the linebackers with two tackles-for-loss. The Irish Blizzard got great secondary play from cornerbacks Ronnie Guyton and Dave Claiser as well as safeties Chris Leblanc, Gareth Watts, and Guimond. 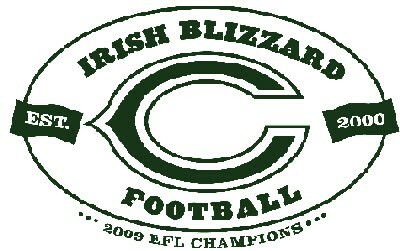 The Irish Blizzard return to action on Saturday July 10th for the 2010 home opener vs. the Hyde Park Seminoles. Kickoff is set for 7pm at Fuller Field. Kickoff will be preceded by a brief ceremony celebrating the 2009 EFL championship. For an updated look at the 2011 Eastern Football League regular season standings, check out the '2011 EFL STANDINGS' tab at the upper left of the screen. Click on the link above or Go to www.myspace.com and search "Clinton Irish Blizzard". CLINTON— It’s official. The town has made it into “Guinness World Records” — and it’s not for that tired urban myth about having the most bars. 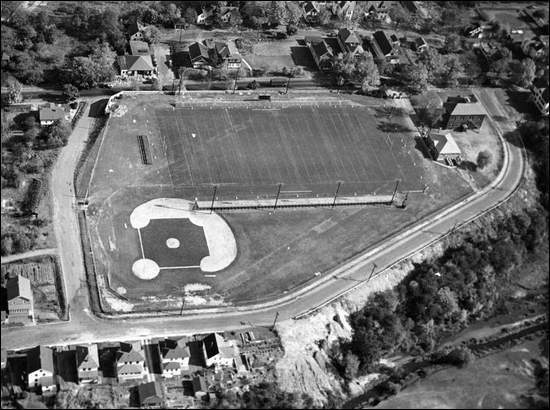 Fuller Field, at 450 High St., has been designated by London-based Guinness as the oldest baseball diamond to have continuously hosted baseball, which it has done since 1878.